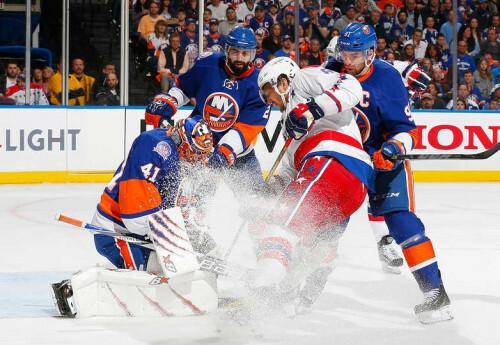 -The Islanders may have limped in to the playoffs, but they’ve turned it around against Washington, and find themselves with a great opportunity to back the Caps in to a corner. The Islanders have done a good job of preventing Alexander Ovechkin from taking over the series (only one goal in three games), but the Caps are only averaging two goals per game as a team. That isn’t going to get the job done in the playoffs. John Tavares cemented his first huge playoff moment for the Isles with the Game Three overtime goal, and has registered a point in each of the three games thus far. Jaroslav Halak has turned away 79 of the 86 shots he’s seen, and seems to be back to being the reliable crease presence he was for most of the season. If the Islanders continue to take advantage of the lack of Washington’s offensive depth, Nassau Coliseum could see another round of playoff games (at least) before closing its doors for good. -Whether or not Detroit wins this series and goes on a run, the countdown of the final playoff games at Joe Louis Arena can begin. With only one more season of Red Wings hockey at “The Joe”, there won’t be many playoff games left in a building that has seen a lot of them. Even though Pete Mrazek was pulled in Game Two for allowing four goals on 18 shots, he’ll get the nod again in Game Three. 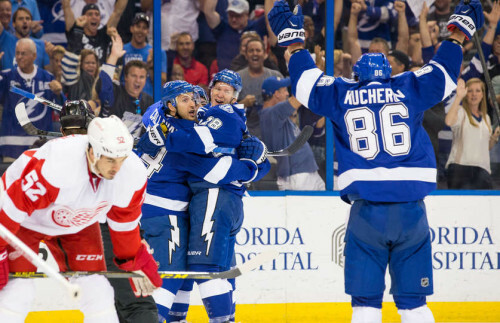 Detroit may be better served by focusing on limiting Tampa Bay’s opportunities and pouncing when an opportunity to gain the Lightning zone presents itself. Steven Stamkos has two assists, but has yet to score. Detroit needs to continue to keep him from lighting the lamp if they hope to pull off the series upset. Justin Abdelkader will return to the Red Wings line-up tonight and give them a physical presence up front that they’ve been lacking so far in the series. – The Predators season could be circling the drain after tonight’s game if they can’t take home ice back in Game Four. 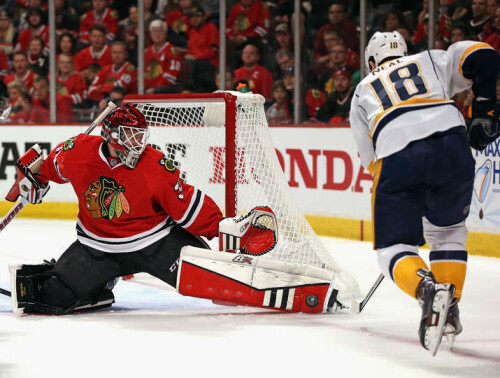 Offense hasn’t been an issue for Nashville, but they need to tighten up in their own end since Chicago’s offense has reappeared after a late-season slumber. Pekka Rinne is one of the best goalies in the league, and this would be a great time for him to pitch a shutout to give the Preds a breath of fresh air. Speaking of goalies, Scott Darling will lead the Blackhawks on to the ice tonight and not Corey Crawford. Darling made 35 saves in Game Two and appears to have the starting gig for the rest of this series. We all know the Blackhawks are full of playoff experience, and they can smell the blood in the water of winning a short series. If they take care of business in the next two games, they will be well-rested for whichever team survives the Blues-Wild series. -This has probably been the best series of the first round, but it doesn’t get the love it deserves because all of the games start at 10PM or later. 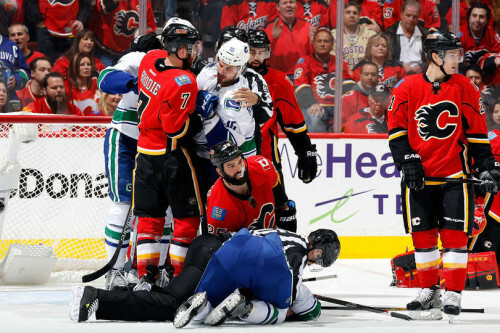 When the NHL revamped its playoff format to increase the venom of divisional rivalries, this is what they were hoping for. This has been a competitive and physical series, and it looks like it’s going to go at least six games. Calgary has a bunch of playoff rookies, but you wouldn’t know it by watching them. Goaltender Jonas Hiller has also been important to the Flames in taking two of the first three games, stopping 78 pucks on 84 shots combined in those contests. Even though the votes are already in, Bob Hartley continues to show why he deserves the Jack Adams Trophy. The veteran-laden Vancouver squad will need to circle the wagons to avoid heading home for a potential elimination game. While guys like Radim Vrbata and rookie Bo Horvat have played well, the Sedins need to make their presence known soon (Daniel has one goal, Henrik has one assist so far). -From the “No Surprise” department, the Sharks and Todd McClellan have “mutually agreed to part ways” (aka he got the ax). This move could have been made a few times over the past couple of seasons and it wouldn’t have been out of place. The Sharks were always one of the more talented teams in the league, but would always unravel in the playoffs. Whether that’s on the players or coaches is always up for debate, but it was time for a new voice in the locker room. When you have a team leader like Joe Thornton taking subtle shots at the head coach on break-up day, it’s a sign that things are beyond repair. McLellan will land on his feet somewhere (probably not until Mike Babcock’s future with the Wings or a new team is sorted out) else, because coaches with seven seasons of experience and playoff appearances in six of those seasons don’t grow on trees. 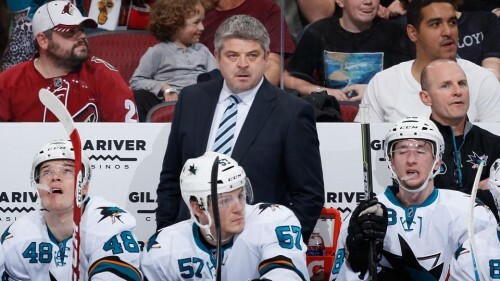 As for the Sharks, they have enough talent to be back in the playoffs next year, but GM Doug Wilson (whose future with San Jose is also murky) may be better suited trying to build for the future. If he can trade away assets for good picks and prospects, he might get a chance to see a rebuild through. If he pushes his chips to the middle and flames out in the first round in 2016, he’ll be looking for a new job next summer.